1998 and it is my first roar for quite a number of years I am 45 years .old. I’ve arrived in N.Z. 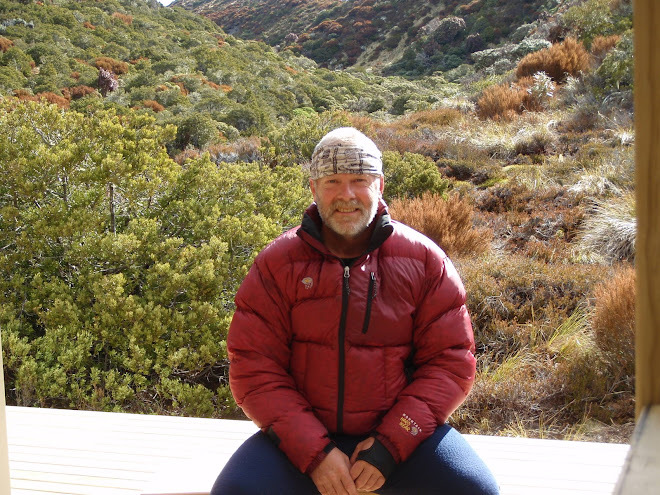 from OZ and I have decided to walk to Ngaawaparua hut. Firstly I land at the Boyds hut by fixed wing. I have enough daylight left to check my new sako .308 rifle on the airstrip ,a three shot group and the Job is done, and now up to the hut for some tea. Everything looks just how I’d left it all those years ago. . Except this time I have no dog as company. Soon the coal range is ablaze and tea is on the way. Man I’ve missed this kiwi bush. 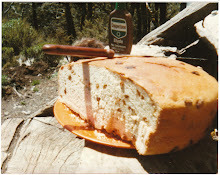 A Hurried breakfast while the valley is still waiting for the first rays of sun. It will have to wait a little longer this morning, as there is quite a thick fog down, Which should make for some interesting travel. Sure enough the waist high tussock grass is wet and cold this hour of the morning. 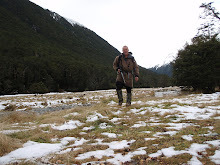 There are quite a few river crossings before the slog up and over to Tussock hut I muse. Actually it provided a great walk. Ideal when you’ve been away as long as I have. It helps to break you in gently. And so it proved to be this morning. I drank in the scenery hungrily with my eyes, afraid that if I should blink .it might disappear forever. 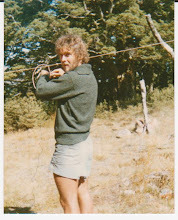 .With me this trip is a 3 piece fly rod, with which I hope to catch my first N.Z. Trout. The walk is full of nostalgic memories and they come flooding back vividly. The terrain transitions from the open high desert like terrain of the upper Ngaruroro River. And now as I enter into the secret dense, Kaweka native bush, the first footsteps in over 17 years. Why have I been away so long? The steep decent nearly over and I can at last catch a glimpse of Tussock hut, through the trees. I note the changes. My mind rolls back the years and I remember burning my foot at this hut so many years ago. 2nd degree burns, and helicopters ride out to Taupo hospital for Toby and me. But that as they say is another story! I push open the door and can see immediately that the inside as been upgraded as well. Gone is the open fire that was an instrument to my burns. To be replaced by the very practical iron Aga types which when properly fed can throw out a ferocious heat. A few twigs, some paper and the billy were soon bubbling. Man I was beginning to come alive. Always a good few minutes spent, with brew in hand and log book checking out the previous visitors, humorous stories, and hunting tales. 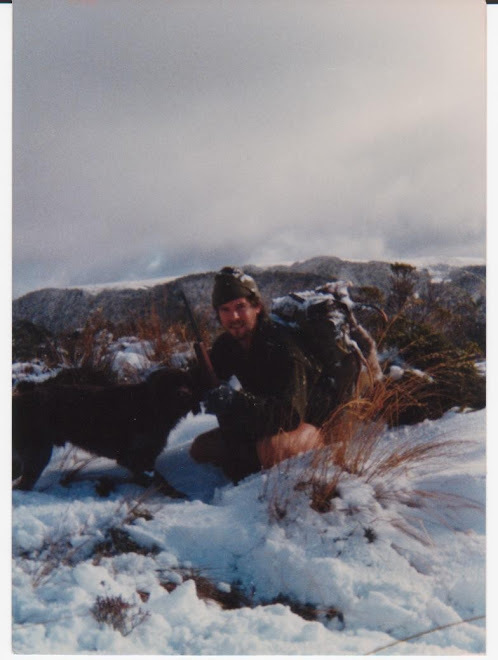 Then it was on with pack and rifle in hand, across that tussock wonderland, towards the Harkness hut. 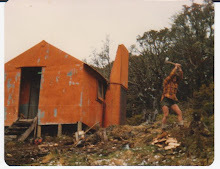 I was 20 minutes from the tussock hut, remembering bits and pieces when emotion took over. Without warning floods of tears coursed down my cheeks, obscuring my vision. I suppose I likened it to an emotional sauna. Whereby the tears where washing the years spent away out of my spiritual pores. Replacing my spirit .Complete once again. After the tears, my heart seemed to swell and soar in almost a painful way, and I felt a real elation. It was so very good to be back. Arriving at the Harkness brought the reality of the changes over the year’s home to me. 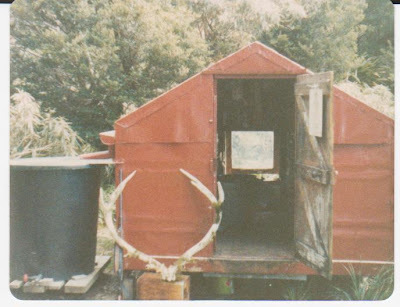 For there was a hut full of hunters there, with every sort of luxury you could possibly need. These boys had been flown in. There was no doubt about that. I’ve seen less booze in some pubs not to mention less food in some supermarkets, and also ammunition in some gun shops. However they were not short of hospitality either. And I soon had a mug full of hot tea, thrust into my grateful hands. I stayed for an hour or more, yarning away grateful for the brews, And the restbite for my unaccustomed muscles. However if I was to reach Ngaawapurua before nightfall I would have to be putting a into g fairly quickly. My mind travelled through time again...... 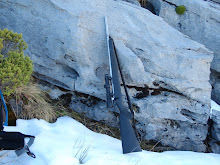 I remembered the time I had broken the stock of my sako222, at tussock and had to walk out to get it repaired. 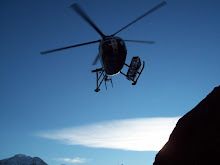 How I ‘d reached Kuripapango base camp that same day with little difficulty. And now, I was feeling pretty stuffed, half way along the track to Ngaawaparua. Times had changed all right. There wasn’t much left of the day, when I saw the smoke lazily rising from the Ngaawapurua hut, and my mind cast back again over the years, to a hot late morning, about 11 .30 or so. And me and Toby where drifting in from the Manson country. We’d just crossed the bridge; or rather I had, as Toby preferred the swim across the ngaruroro. And this particular day he definitely had the right idea. On approaching the hut the dog became very keen. Head lifted, and quick sniffs, with that half closed eyed look of pure ecstasy. Don’t be silly dog I chastised. Taking in the time and general heat of the day. Plus the general lack of cover, there was just no where to hide up. I dismissed the dog entirely. 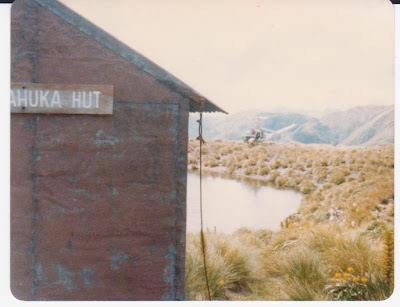 We were passing through to Te puke, so it was a quick squizz at the hut book, sign it and shoot on through. The door was open, as I would soon be going through it again. When a loud drumming of hooves attracted my attention, and a deer shot past the doorway. [Which was in a different position then] . 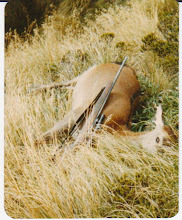 By the time I had collected my rifle, the deer had found sanctuary in the all-encompassing bush. His marks where there though, the scuff marks were plain to see right to where he had skidded when he changed direction to follow the uphill grade. We followed for some way. With the sika whistling but just keeping enough in front of us. After some time I called it off. A glance at my very smug looking mutt told all ,as we retreated back to the hut. Reminding me not to take him so cheaply again. 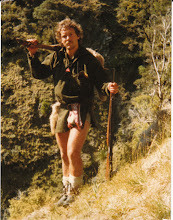 .... And that reminds me of the first bit of guidance I had from Roupee van Der Voort when I arrived in the Kawekas. Never unload your rifle till you can touch the doorknob of the hut. 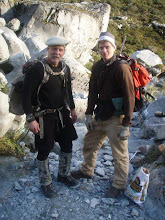 There were two men in residence, a very likeable father and son pairing, with a deer in the meat safe, they were enjoying some success as well. 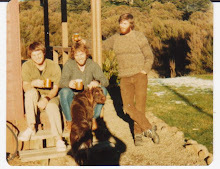 It was evident after some yarning that things had changed big time in the Kawekas. Every hut would be booked out during the roar ,I was being told . How we deercullers would have loved that! [Not]. But on the other hand I can also see why they, dispensed with the services of paid ground hunters. It certainly gives me a sense of privilege to think I had experienced the good times. I had my memories as they say. It was one very psyched up hunter, wolfing down the porridge next morning and picking up the virgin sako 308, and heading across the walk-wire. 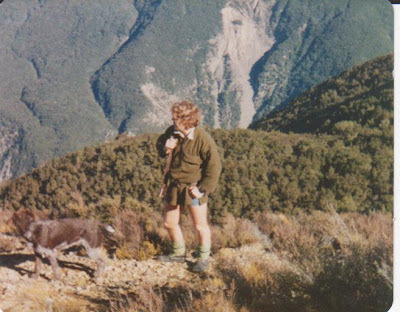 I’d made a couple of hundred feet elevation, enough to drown out the busy Ngaruroro, when I heard my first roar. Way down and what seemed to be across the river. A Jap and going well too.... Ah it was so good to be back. It was getting on for noon and I’d been dozing. A Sika hind bolted along the terrace in front of me. I suppose I could have got a snap shot away but the first problem to be addressed was that I was moving far to fast. I should have had that shot at a standing animal. Minutes later, I was approaching a very big slip. Which was mostly covered in second growth. I was about to take a couple more steps to look over the lip and have a more generous view. When a shrill whistle disturbed the silence, sounding unusually loud. Without further delay I made 3 or 4 quick strides to the edge of the slip. The whistling continued, but try as I might, I was not able locate the Jap. She was Some-where in the middle of the slip …but where? Stones rattling there she was with Bambi in tow making a U-turn at the apex of the slip. Hurtling along one of the few open areas. This time my snap shot was on. One fluent movement the merging hairs of the leupold 1-4 traversed the length of the hind. Squeezing the feather light trigger of the stubby barreled Sako the moment there was a suggestion of daylight ahead of it’s nose. For a fraction of a second I’d thought I’d squeezed too soon. Boompha, the falling body and flailing legs however told a different story. The Bambi made one more body length with her momentum and was swallowed up, by heavy bush on the other side of the slip. The range would have been a 100 yards +and it took me a few minutes to relocate the deer. But at last there she was, the first deer in a long while. I was surprised to find later whilst dressing the animal out that she was still lactating. 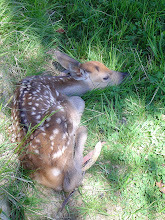 In fact I don’t remember ever having come across a Bambi in the rutting months before. Let alone one still being weaned. I now had my camp meat, the hunter had truly returned. I was to shoot another couple of animals for the trip but alas no trophy material. The wasps however, where a shock to the system as far as I can remember I don’t think there were any when I was with the forest service. 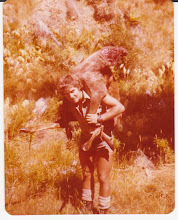 It was next to impossible to try and process the meat anywhere near the hut. Far betters to wait till after dark and do the job by lamplight. But the real highlight of the trip was to follow. The track back to tussock was uneventful, reaching there, mid afternoon. After an early start from Ngaawapurua. The hut was empty as I’d left it, and I was pleased to have my last night there to myself. I was due to fly out in the afternoon, of the next day. So the plan was to wave the evening hunt, and get up early in the morning for a poke around. The morning dawned clear as a bell The hint was that it was going to be blue skies and sunshine, to farewell me on this great trip. A hasty decision, I’d lugged this rod from oz. Surely it was time to make full use of it. The weather being so fine, was the determining factor. Hell I’m going fly-fishing! 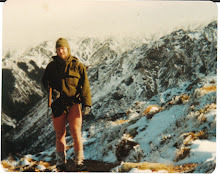 Packing the rucksack in record time, and it was off to the Ngaruroro, to spend the morning. The vistas of open tussock country greeted me on emerging into the Ngaruroro valley. Below me meandered the river itself in its infant stage, narrow, clear, fresh and high tussock bank to bank. Just the start of it’s long journey to the coast. There was quite a stiff breeze picking up. Tossing the yellow tussock this way and that and contrasting with the blue ribbon of the “Toddler ”Ngaruroro, and the still bluer sky. It indeed was an awesome sight, and when you add to that the feeling that you have it all to yourself. Is it any wonder that the emotion over flows at times? I dropped my pack and rifle by a conspicuous bush loaded up the rod with large hopper dry fly, and about 12’ of tippet in front of a sage 6 weight forward line. I then proceeded to explore downstream with the intention of fishing back to my gear. The water chattered away in the rapids and grew serene and tranquil in the pools. It was always gin clear and a pristine freshness pervaded all. There were trout too, at least one in every pool, languishing deep in the turquoise pools or feeding gently in the riffles. The tussock grasses where bone dry, and with every step I would disturb endless amounts of hoppers. Some hurling themselves into the busy river, to be borne away destined to end up in a big trout’s belly. Eventually I curtailed my adventures downstream, as I did not want to wander too far from my gear. The river was becoming more gorge orientated ,and also by travelling down the river I was putting down too many fish. So now with the sun in my face I proceeded to fish my way back. At times having to cross and recross the cooling waters. Eventually I came to the tail of a very long pool. Resident there, were 3 big rainbows, about 18 ins, from the surface and as many ins. Apart. They swayed this way and that, forever scanning the stretch of water in front of them in the hope of spying some morsel or other. The stiff breeze would blow intermittently and ripple the surface and shield them from inquisitive eyes. Whilst making ready ,one then shortly, another of the fish darted with some purpose upstream, I could barely see the remaining trout, as I made my false casts. The breeze was really getting up now, and I had to direct my fly into the wind. So as not to line the trout. The wind was my ally this day, as the hopper landed a couple of feet upstream of the rainbow and was floating naturally over him. By now the fish was invisible, but the sudden splash relieved the tension. I gathered the slack line as fast as I could, the line went taught. It trembled slightly and then the sage 6-weight rod bent savagely into action. The fish angrily shook his head and tore off downstream leaping out of the water. He next returned and this time blatted upstream, wow I had some fish on here. The fight lasted some minutes, but eventually I coaxed him up to the surface, where I could see what a really good hook hold I had, right in the scissors. I relaxed a bit then and managed a few photos from the camera that was around my neck. I then played the trout gently into the waiting net. I guessed that he weighed around the 7 lb. Mark. The sun glinted off the greens and purples of the rainbow trout’s flanks. Not for nothing are these fish named rainbows I thought. 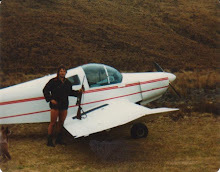 Then pack on and the gentle trudge up to the Boyd hut to await my fixed wing taxi, out of paradise. 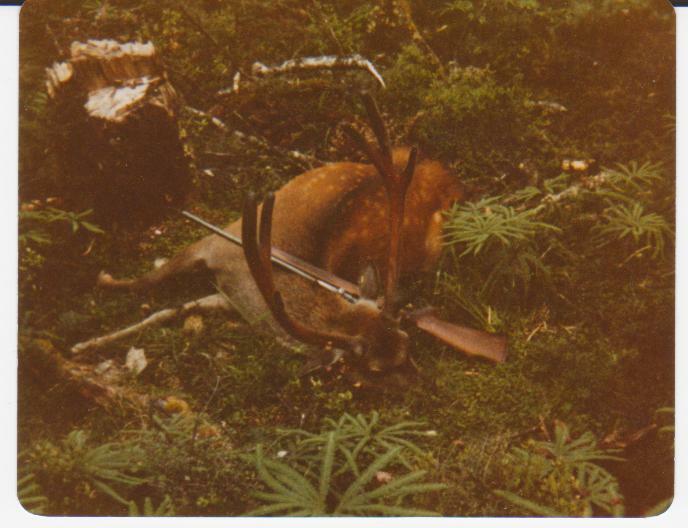 The incidents occured consecetively over the three days, and were very similar,which proved to me that the sika stag during the rut ,is a totaly different animal to the rest of the year.......more prepared to fight than run. This particular day, on closing the hut door, to heavy overcast weather, gun metal Grey sky, with more than a threat of the vertical moisture. Windy too, picking up all the time, and cool enough to be wearing the ole swanny all day. Which is a sure indication winter is round the corner, and the easy days are behind you. Anyway, the dog and me decided [telepathically] that we would be better off down East creek. Way down, out of this swirly wind. Anyway creeping along, Indian like [and that was only the dog], for there was fresh sign a plenty. Deep down into east creek,we were now out of the worse of the wind, here there was a gentle breeze, blowing the right way,which was in your face!! Although looking skywards the clouds were fair scudding along. We were following not too far behind a sika stag. Then the unmistakable stench of deer, like a wall of smells you physically had to push yourself through. Toby warned me with his eyes, as we eased ourselves out of a small, only trickling creek “Watch those big size 9’s boss” he screamed, in the noiseless-pollution. I warned him back just as noisilessly. Barely moving, side by side we eased into an open corridor in the bush. And there, standing at the end of it stood our stag. No more 20 yds separated us. He was looking me right in the eye; I would have had a bowel movement if I’d thought him similarly armed. I eased the sako up slowly but fluently expecting him to take a hike any second, the crosshairs found his head. Christ am I really going for a head-shot? Why not it’s filling the scope pressure on the trigger, ....click.!!! Still looking at the deer in the scope, my mind racing,....... and a misfire? I don’t believe it . I don’t believe that the stag is still there looking at me. Trying to be as fluent as possible, expecting the deer to move anytime. I managed to reacquaint myself with his image, once again. Ejecting the offending round and chambering another, again the trigger squeeze. A little more emotional pressure was experienced this time. I was rewarded with a Boompha. The dog the deer and myself didn’t move a muscle, the report still ringing in my ears.! I worked the bolt, levered in a fresh round, and put the rifle back to my shoulder. That’s when he took off Breaking branches just crashing headlong through the scrub. The dog gives me a withering look,....... I don’t remember reading that in the script he muttered. I was understandably shaken. You do not miss from that range. I could still hear the stag clattering away, albeit further with every stride . It must have been pure frustration cos...... I sent the nasty one after him, with a ‘GET HIM’. Toby vaporized he just didn’t go, he simply didn’t exist for me. That dog didn’t usually have to be told to go chase deer. So when he actually heard the words, well let’s just say he never said what? Pardon? Say again? I was mentally thrashing myself with the biggest branch I could find, when I heard the barking. Quite loud, which sounded very much like a bail. I jerked myself into the present and steamed off down hill in the direction of that wonderful barking. Under and over logjams, tearing through bush lawyer and the like, in and out of creeks. The barking would often stop and start again further away, so I would go as fast as I could toward the noise stop then listen then go again. Eventually breathless and battered, I arrived at the river. The barking was deafening in the confined space. Looking downstream I was rewarded with a wonderful action scene. The stag, head down was charging Toby, in the middle of the stream. Toby was half swimming the water was splashing everywhere the sako was up in a blur. Too fast cos the .222 round found the space between deer and dog. A geyser of water leapt upwards between the animals. 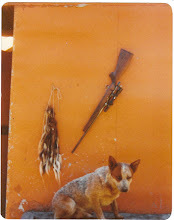 They neither batted an eyelid, although I suspect the dog’s thoughts on my marksmanship are unprintable. Finally the next time I drew a bead, marked the end for the stag. I reached them; the stag half-immersed in the river slowly drifting downstream, with Toby hanging off its rear end. I just had to examine the head for my own piece of mind, sure enough a hole straight through both its cheeks. Day two, again I give rein to the dogs natural instinct to chase , though more this time ,to curiosity rather than frustration. 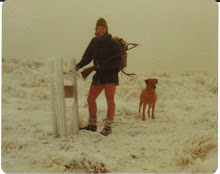 The weather pattern was much the same, as was the locality of our hunting, and again I had the box seat to the action. On a face across the stream.I watched as the stag flat out sped across. Half a dog length behind was the mutt. 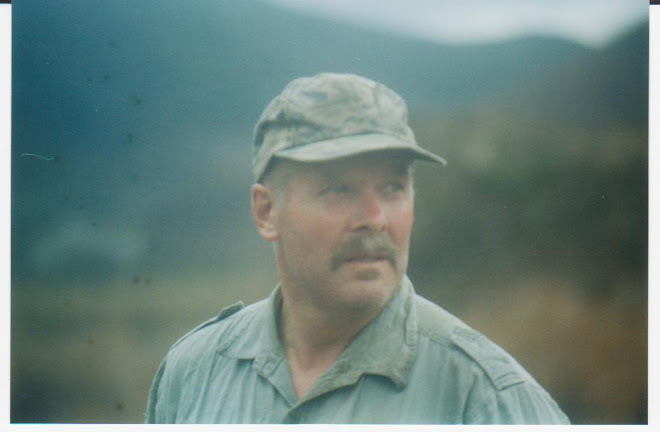 The range was around the 80 yd mark ,I was leading plenty ,and at neck height .Twice I sent smoking empty .222 brass cartwheeling towards the bush floor,it made little difference to the action in front ,jacking in a fresh round ,the stag turned sharply and executed a 90‘ turn,and galloped straight toward me ,across the stream ,and disappeared under the bank I was standing on,that’s when the real commotion started ,scuffling of foliage ,breaking of branches, and of course barking ,it only took a few steps to peer over the bank to witness the scene,similar to yesterday ,but close this time so close I could just reach out ,the speed of the stags thrusts were impressive from where I stood ,i’m sure the dog was equally impressed,whilst the antlers where in his face the dog had no choice but to retreat,but the minute the deer raised his head for a look ,Toby regained a little ground, with one hand I reached out ,and the sako ,with it’s abbreviated barrel,was an inch or so from the heaving neck of the deer , a beckoning motion of the index finger,against the canjar trigger,boompha ,and all was quiet yet again in bush city. I was in a different watershed all together ,for the final of this triology,the deer scattered in all directions,a stag and four hinds,to everypoint of the compass, that jacksy ripping wind again, don’t you just love it ? Blurred grey bodies and laughing white tails, Go get him! I said to canine ,i think I managed ...g in go and I was on my own! Are the ears playing tricks on me ? Was that a bark ,the wind was now scuffling leaves along the bush floor,and rustling the branches overhead,mouth open now [supposed to inprove hearing! ],i move further towards the sounds ,yes a definate bark,quicker now .i pick up speed ,,the barking gets louder,obviously a bail . I pull out allthe stops and run down hill throwing caution to the wind.And I stumble right in to the action. The stag is imprisoned , his antlers are caught up in bush lawyer ,and he is frantic ,he is kicking out in all directions ,the dog going in where he can.Upon seeing me the stag makes an almighty lunge ,and frees himself enough to rear up on his hind legs ,towering above me front hooves flailing at the air,although still caught up in the lawyer, and supplejack. I level the .222 from the hip and direct my fire toward the chest region ,boompha ,he convulses and falls sideways ,it’s over. .....Those three days educated me in ,the fiery nature of the sika stag, and how in the roar at least , he is prepared to stand his ground and fight ,rather than other times in the year where perhaps descretion would have been the better part of valour rule. ...He would have been long gone. 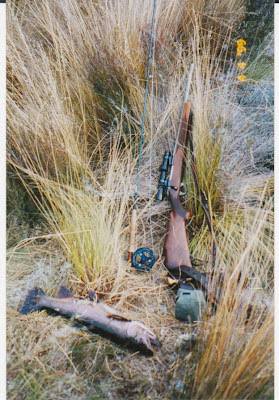 More from the diary.......Twelve months of Cray-fishing behind me, and I’m back shooting deer for a living, this time in the Kaweka ranges,[A scrubby range west of Napier] I’ve changed my rifle. It’s now a sako vixen, in .222 cal.with a cut down 19” barrel. I also have a different dog, his name is Toby, and he is a red merle.Australian cattle dog. The next couple of weeks, were spent in the re toughening up process, after 12 months lobster fishing, the bodies computer has to be reintroduced to climbing mode! Even wearing shorts again. The cold wind the abrasive scrub took care of toughening the skin. The hairs on the legs were introduced savagely to such delightful plants as hook grass, which render your legs, to Kojak head lookalikes in very short order. There were plenty of deer, on the Burns range, but the job was to rid the place of sheep A sheep shooter! What next? Generally what you saw you usually shot, unlike deer and even goats. Wild sheep maybe, but still sheep. 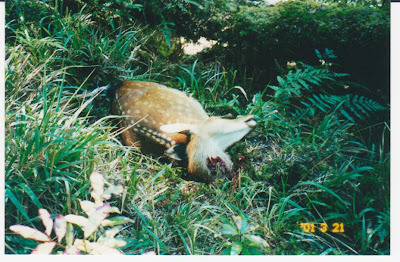 The difference being, the tips of the ears were now the proof of kill, not the tail which is just as well. The prospect of walking around with a few daggy tails on my belt was not exactly inspirational. I was high up on the Burns range, in a stiff breeze, overcast conditions, and gunmetal sky hunting the many clay pans that abound the area. When I spied a lone ram, some 100 yds. Beneath me, quickly bringing the compact 8x20’s to bear. I could see he had a double curl to his horns. 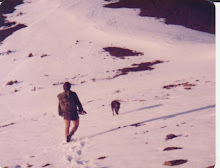 Now standing there in the open, with the wind plucking at his shaggy unkempt fleece, he could well have been a trophy Dall ram, high up in the Alaskan wilderness. I’m afraid that is how it seemed to affect me. As I closed the gap down to around 50 or so yds, I noticed that my heart was racing far too quickly, the cross hairs on the leupold 1-4 scope where dancing around, enough to give credit to Fred Astair. I of course attributed this to the high winds! The first 50-grain emissary merged with the landscape, [Somewhere!]. The ram, in full flight now, was reluctant, to stop, but stop he did. It was a hunter awash with woe that ejected his third empty case, and was able to take his proof of kill. It was often windy on the Burns range. Offsetting that was the fact that most days dawned dry. Which is always preferable to that vertical precipitation . 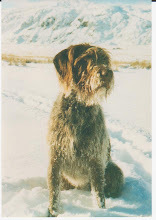 The Following winter, [and the year escapes me at the moment,] was the first liberation of the upland game bird ‘Chukor. I was camped with two different guns, Dave Pratt and Andy Marden, and we had a bet on, as to who could bag the first Chukor. Not the cleverest of ideas, but an insight to the level that sheep shooting can reduce a man to. I won the bet, but it was a sorry bird, that was paraded, and then hastily buried that same sorry evening. 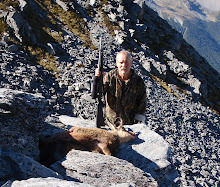 I am a big fan of the .222 and had two wonderful years, using it to deadly effect, shooting both red deer and sika in the Kawekas But two things for me built my confidence. Firstly the N.Z.F.S. supplied us with American brands of ammo. DEFINITELY not designed to give you an edge for deer hunting. Too fragile! The second big edge I had was my dog, In the likely event of not hitting the target as sweetly as you’d like and the deer putting some distance between you. The dog is the one that is more likely to track that animal down, quicker and more effectively than any man. 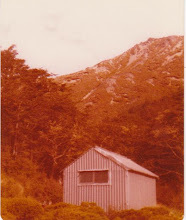 Te Pukeohikarua, Harkness and Tussock huts were the main targets, for deer reduction in my day. Te Pukeohikarua in particular was a great favorite of mine. [It unfortunately has changed quite a bit these days]. 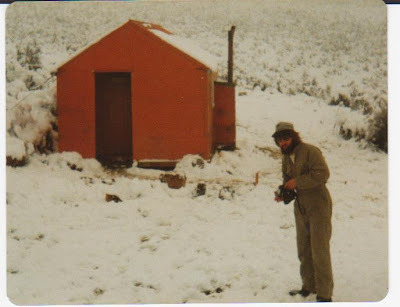 I once spent 4 weeks on the trot hunting from that hut. There are so many watersheds available close to hand. It wasn’t too long before I was able to suss out, exactly where the small pockets of red deer lived. 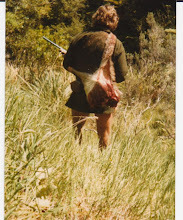 I regarded this as great advantage continuous sika hunting can wear a man down. Often was the day I would say to myself, right I’m on reds today, and would find them so much easier to hunt, almost like having a w/end off. Looking back on my success in the Kawekas, I would in fact pinpoint my advantage over my fellow cullers, as being just that! The ability to find and shoot the much easier red deer. My tallies at the end of six weeks would almost always be at least close to half-and-half red/sika ratios. 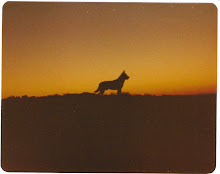 Whereas, my contemporaries would tally maybe one third of my overall tally, but would feature all sika tails! The roar is a magical time of year, and as deer cullers we were no exceptions. This was the highlight of the year, make no mistake. The weather of this particular rut, 1980? Seemed to roll on, everyday similar to the last, in as much as they were cool, and mostly dry always overcast but unfortunately, with the arch enemy, the everpresent wind to make things a little interesting. 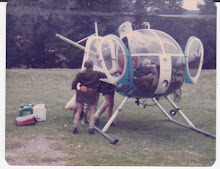 It made a contrast to the days of summer, those long endless, hot, dry trips where a man would lie in his bag in the late morning, gently coming awake to the drone of a few dirty big blow flies. The cullers alarm clock! Not to mention the gentle but progressively, urgent thumping of Toby’s tail against the hard wooden floor of the hut. This particular day, on closing the hut door, to heavy overcast weather, gun metal Grey sky, with more than a threat of the vertical moisture. Windy too, picking up all the time, and cool enough to be wearing the ole swanny all day. Which is a sure indication winter is round the corner, and the easy days are behind you. Anyway, the dog and me decided [telepathically] that we would be better off down East creek. Way down, out of this swirly wind. Anyway creeping along, Indian like [and that was only the dog], for there was fresh sign a plenty. Deep down into east creek,we were now out of the worse of the wind, here there was a gentle breeze, blowing the right way,which was in your face!! Although looking skywards the clouds were fair scudding along. We were following not too far behind a sika stag. Then the unmistakable stench of deer, like a wall of smells you physically had to push yourself through. Toby warned me with his eyes, as we eased ourselves out of a small, only trickling creek “Watch those big size 9’s boss” he screamed, in the noiseless-pollution. I warned him back just as noisilessly. Barely moving, side by side we eased into an open corridor in the bush. And there, standing at the end of it stood our stag. No more 20 yds separated us. He was looking me right in the eye; I would have had a bowel movement if I’d thought him similarly armed. I eased the sako up slowly but fluently expecting him to take a hike any second, the crosshairs found his head. Christ am I really going for a head-shot? Why not it’s filling the scope pressure on the trigger, ....click.!!! Still looking at the deer in the scope, my mind racing,....... and a misfire? I don’t believe it . I don’t believe that the stag is still there looking at me. Trying to be as fluent as possible, expecting the deer to move anytime. I managed to reacquaint myself with his image, once again. Ejecting the offending round and chambering another, again the trigger squeeze. A little more emotional pressure was experienced this time. I was rewarded with a Boompha. 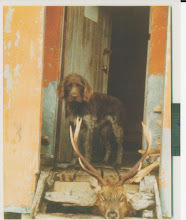 The dog the deer and myself didn’t move a muscle, the report still ringing in my ears.! I worked the bolt, levered in a fresh round, and put the rifle back to my shoulder. That’s when he took off Breaking branches just crashing headlong through the scrub. The dog gives me a withering look,....... I don’t remember reading that in the script he muttered. I was understandably shaken. You do not miss from that range. I could still hear the stag clattering away, albeit further with every stride . It must have been pure frustration cos...... I sent the nasty one after him, with a ‘GET HIM’. Toby vaporized he just didn’t go, he simply didn’t exist for me. That dog didn’t usually have to be told to go chase deer. So when he actually heard the words, well let’s just say he never said what? Pardon? Say again? I was mentally thrashing myself with the biggest branch I could find, when I heard the barking. Quite loud, which sounded very much like a bail. I jerked myself into the present and steamed off down hill in the direction of that wonderful barking. Under and over logjams, tearing through bush lawyer and the like, in and out of creeks. The barking would often stop and start again further away, so I would go as fast as I could toward the noise stop then listen then go again. Eventually breathless and battered, I arrived at the river. The barking was deafening in the confined space. Looking downstream I was rewarded with a wonderful action scene. The stag, head down was charging Toby, in the middle of the stream. Toby was half swimming the water was splashing everywhere the sako was up in a blur. Too fast cos the .222 round found the space between deer and dog. A geyser of water leapt upwards between the animals. They neither batted an eyelid, although I suspect the dog’s thoughts on my marksmanship are unprintable. Finally the next time I drew a bead, marked the end for the stag. I reached them; the stag half-immersed in the river slowly drifting downstream, with Toby hanging off its rear end. I just had to examine the head for my own piece of mind, sure enough a hole straight through both its cheeks. 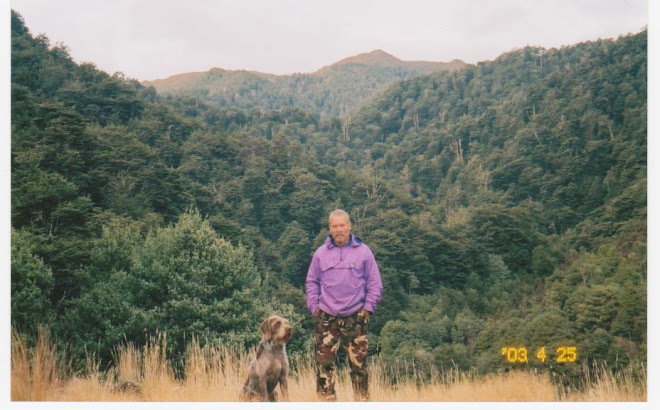 More from the diary....... We then traveled down to Neill forks, spent the night there, then on to Mangahuka, the highest hut on the block and I believe the best hunting also. We were almost at the end of the climb when Gary’s, dog “Lassie” started winding off to the side. Packs still on we followed the questing dog. Gary up till this time was having a bit of a rough time with his hunting. It comes to us all at one time or another, and it’s a case of the harder you try the worse it seems to get. But you have to keep on trying because sooner or later the hunting gods will smile on you once more. I am afraid they we were not about to smile yet awhile. I stayed where I was whilst Gary sneaked down to where lassie stood stock still staring straight ahead. I saw his rifle come up and boompha ,the cut down 303 spoke. The next moment a hind, at a quick walk came into view. There was a small gap in the scrub, into which she moved. The Mauser came up and coughed up 130grains. The hind collapsed where she stood, I was half hoping Gary’s deer was down also and this was another, trying to escape. Until I saw him with his hands on his head and pure anguish written on his face. It all told such a story of woe that needed no words. 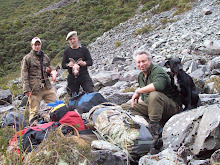 After a couple of days of still continuing good weather, at Mangahuka the hunting gods where still smiling at me, but where positively laughing on Gary. 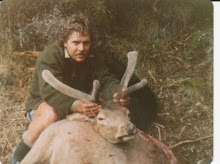 ...Yes his luck had changed at long last, and the deer where starting to feel the wrath of a deer hunter back in form. It was time for a change of scenery. 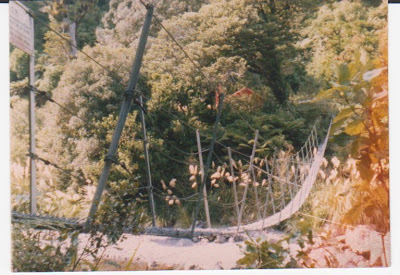 Gary remained at Mangahuka. I decided to trudge my way along the main range. 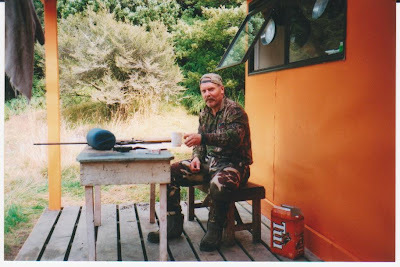 Early that same clear morning, on the way to Aokaparangi bivvy, I picked up a dozy spiker. Even at that early hour, in the short time it takes to tail and whip off a couple of backsteaks, there where clouds of blowflies, droning about my ears. What a feeling though, to score so early in the day. 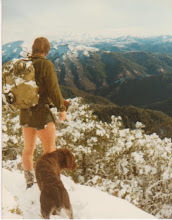 The sky was blue and not a cloud in sight, walking through the golden waist high tussock, , Able to wander where I pleased, physically fit and to be paid, as well. Man I was really living! pitched forward in a heap whilst the report of the .270 was still reverberating around the h ills. That’s what I call handy camp meat, both animals where well within 250 yds of my bivvy.